Home / Columns • Fanboying! • RIP • Stars of the 1980's and 1990's / RIP John Hurt! Remembering The Acting Legend! Star Of Alien, The Elephant Man and Harry Potter Just To Name a Few! I was so sad when I heard that John Hurt had passed away. I’ve been a fan of his for a long time. 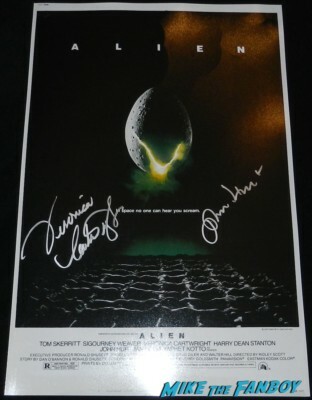 Alien is one of my favorite films of all time, but he’s also been in The Elephant Man, Harry Potter, and so many other classics like V For Vendetta! 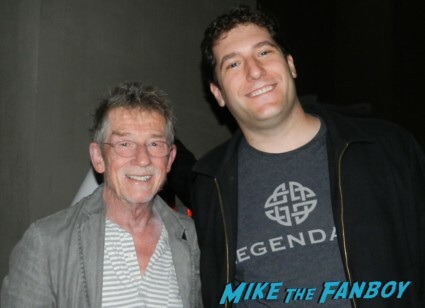 I was lucky enough to meet John Hurt, who was such a sweet and humble man. Scotty and I went to a play he was in back in 2012 and he couldn’t have been nicer. I have to tell you, there are acting legends and then there are stars. You know, to me some of the best actors are character actors. They are just so interesting and always play such interested characters. We headed over to the theater. Scotty was there already and we looked around for a spot to wait. Or thee spot I should say. Also on this Goonie adventure was MTF reader and all around awesome guy Michael who ironically just sent me a facebook message about this very theater. He’s here with his wife. 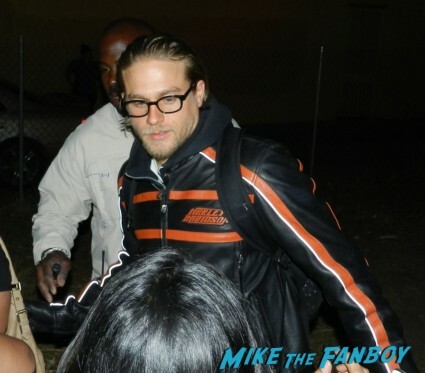 I aways appreciate those with great taste in actors! Appreciating the truly great actors is something that gets lost on people and fans nowadays. Gregg is on the side and someone from the theater comes out and asks if w are waiting for John. Gregg says yes, and then he tells us exactly where to stand. You don’t get that everyday. Sure enough about 10 minutes later out comes John Hurt smoking. He comes right on over to greet all of us. Honestly, he is such a nice man! I was a little taken aback about how kind he was. He would just sign everything and everything put in front of him. 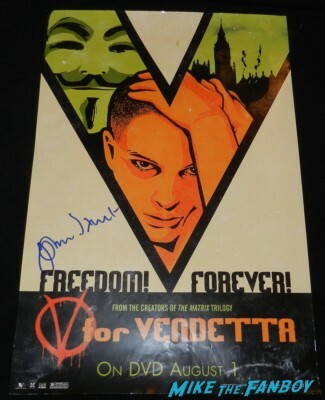 John signed my V For Vendetta mini poster and then my Alien mini poster as well. He then signed my photo and said, “I’ve never seen this photo!” It’s a pretty famous photo, so I’m a tad surprised. 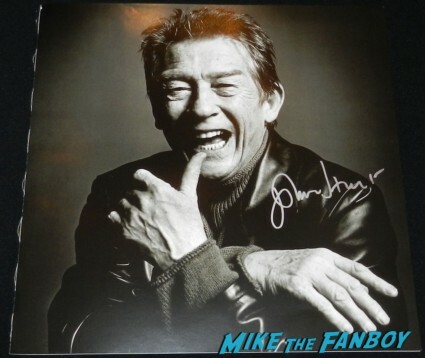 John hurt signed Scotty’s Harry Potter mini poster and his Contact one sheet as well. John Hurt was so nice! 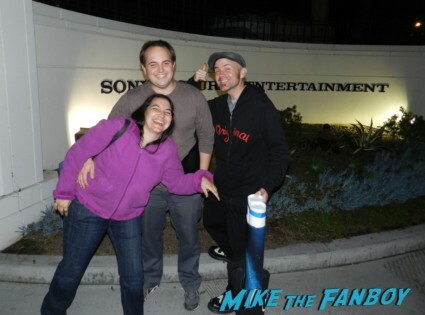 He signed Michael’s figure as well. Then he did photos with everyone. I mean seriously, one of the absolute nicest people I have ever met. There really needs to be more evenings like this. It was calm, it was fun and most of all it was a great memory of meeting an acting legend! Plus, hanging with awesome people is pretty cool too! Ant-Man and the Wasp Taiwan Fan Event! Paul Rudd and Evangeline Lilly Greet Fans! The Day I Met Mary Louise Parker… Captured On VIDEO! Oh Yeah My Insanity Is Recorded For The World To See! Nancy Botwin! Weeds! Autographs! Mary Louis Parker Sexiness! I love reading stories like this. So glad to read John Hurt was super friendly and down to earth. It’s celebs like John Hurt that still make this hobby fun. God Bless Mr.Hurt!